The best master builders in the whole of Europe and Arabia want to demonstrate their skill. Employ the most suitable teams of builders and make sure that you always have enough of the right currency. With their help towers can be constructed, gardens laid out, pavilions and arcades erected and seraglios and chambers built. I really like this game. It works best with 3 or 4 players, although it holds up to 6. Positives: it's easy to learn and play, it's attractive to look at and well put together component-wise (as are most Queen games), you can buy lots of variants, it moves along quite quickly with 2, 3 or 4 players, there's a plenty of strategy, a degree of luck to stop it getting stale, the theme and play is quite relaxing which makes for a pleasant evening, you can plan ahead but not so much that it dreis the game up. Negatives: there's not much player interaction (though beacuse it's light there is a fair bit of heckling and social interplay), some might find that there's too much luck (particularly if someone keeps managing to get two actions by paying the correct cash), if you get a bit boxed in it can be hard to sort that out (but then again good play should mitigate against doing that). It is somewhat reminiscent of Princes of Florence, but I prefer it to that game as this is less dry and more fun. The lack of interaction is about the same, but this just seems more of a pleasant way to spend an hour. It's definitely lighter than PoF, but then again if I want a heavy or heavy medium game, I'd never pick PoF anyway, so in that sense there isn't such a direct comparison - I might well pick Alhambra when a light-medium game is required. 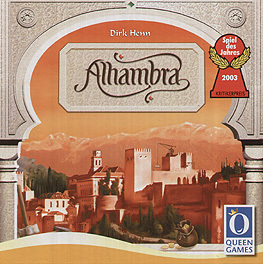 Alhambra is a tile-laying game, where each player builds up the palace garden in front of them by buying tiles from a central market. careful placement of the tiles is essential as the the game progresses to make the best use of the wall score, as although you can change the llayout of your garden, it can take several turns to do this, while at the same time your opponents are all the while adding onto their gardens! The game well-deserved its game of the Year award and is a recommended buy.